12/20/2018 (08:00PM - 10:00PM) (Thursday) : Series Finale As Christmas arrives in the Bunker, the Time Team is inspired by a visit from their future selves to find a way to try to save Rufus (Malcolm Barrett). But when the Mothership jumps to 1848 California, they're forced to put those plans on hold and chase Rittenhouse back to the Gold Rush, where they encounter one of the era's most dangerous villains. Then chasing the Mothership to Korea in the winter of 1950, our team helps a stranded, pregnant refugee attempt to escape a tragic fate. Stuck with no way out, our team faces its toughest challenge yet, and in the process, come to terms with their feelings for each other. Also starring Abigail Spencer, Matt Lanter, Goran Višnjic, Sakina Jaffrey, Paterson Joseph and Claudia Doumit. 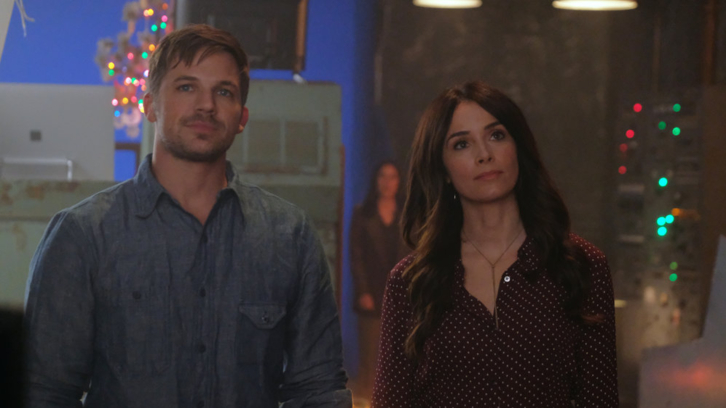 NBC will air the two-part "Timeless" series finale on Thursday, Dec. 20 from 8-10 p.m.
"Timeless" executive producers Eric Kripke, Shawn Ryan and Arika Lisanne Mittman are promising fans an epic, unforgettable thrill ride through the past, present and future, with a healthy dose of Christmas spirit. Spread across three centuries and two continents, the finale will test Lucy, Wyatt and the entire Time Team like never before as they try to #SaveRufus, preserve history and put a stop to Rittenhouse once and for all. The cast includes Abigail Spencer, Matt Lanter, Malcolm Barrett, Goran Višnjic, Paterson Joseph, Sakina Jaffrey and Claudia Doumit. "Timeless" is a production of Sony Pictures Television, Davis Entertainment, MiddKid Productions and Kripke Enterprises.